While eyelid problems are usually harmless, they are highly irritating and some may even require surgery or laser treatment. Our eyelids are crucial for maintaining good eye health. They serve a lot of functions such as preventing direct injuries to the eyes (covering and blinking), protecting against dust and foreign debris with the use of eyelashes and spreading of the tears regularly over the eye surface to keep our cornea moist. With all its goodness, similar to other parts of our body, eyelid can get infected, inflamed and even injured. Some eyelid problems may even cause scarring of cornea and even vision loss. Here are some of the common eyelid disorders which you can look out for. Inflammation of the eyelid margin, blepharitis is one of the most common eyelid disorders. Symptoms include itchiness, burning and foreign body sensation, excessive tearing, blurred vision, redness of the eye and sometimes crusting of the eyelashes on awakening. There are several natural remedies to provide immediate relief to this eyelid condition. Learn more by clicking on the heading. Characterized by a lump on the eyelid and is usually caused by blocked oil glands in the eyelid. 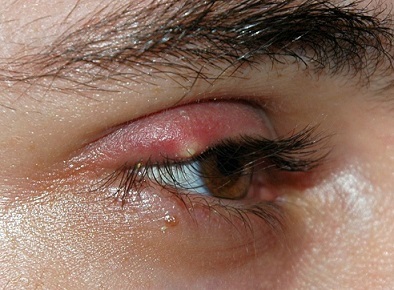 This condition is often mistaken for eye stye but is usually less painful. Repeated growth in the same place may mean the lump is pre-cancerous. Look out for signs and how to get it treated. They meant inward and outward turning of the eyelid respectively. Entropion results in the eyelashes scratching against the cornea and surrounding soft tissues, causing irritation and inflammation. Ectropion exposes inner eyelid, causing extreme dryness to the cornea. This is most often seen as an aging change in the skin, where the lower eyelid becomes loose and pull away eventually from the eye due to gravity. Treatment generally involves some form of tightening such as surgery which enhances form and function of the eyelids. Also known as hordeolum, is one of the most common eyelid problems. It is a red, tender lump that appears on the edge of or beneath the eyelid. It is caused by bacterial infection of gland or hair follicle. While stye usually recedes over time, applying warm compress can speed up recovery. However, it is contagious and can spread to your other eye if not properly. Learn how to get them treat quickly and safely. Commonly known as droopy eyelids. This condition occurs when the upper eyelid droops/fall due to weakness in the levator muscle (responsible for lifting the eyelid) or damage to the nerves controlling the muscles. It can be caused by aging, injury or prolonged usage of contact lens. Some children may even be born with it, which if not intervened early, can cause permanent lazy eyes and eventual vision loss.